NINE Kaneohe homeowners were stunned to hear that the state wants to tear down their homes and build a pond to prevent flooding in their neighborhood. State Department of Transportation officials told the residents Tuesday night that is the best answer to flooding in the area. The owners' reaction was "shock," said Owen Goya, who has lived on Kupohu Street for six years. "We're upset about it," Goya said yesterday, "but what can you do?" 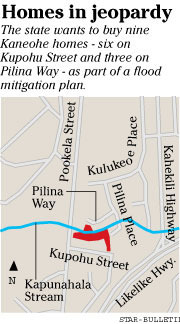 Affected residents of Kupohu Street and Pilina Way have land that backs up to Kapunahala Stream, which flooded severely in 1996 and has been eroding yards since. The neighborhoods are mauka of Kahekili Highway and south of Windward Community College. The state considered other solutions, including lining the stream bed with concrete or bags of rocks, said transportation spokesman Scott Ishikawa. But it concluded that removing 10 homes and creating a $3 million detention pond in their place is the best option. The state has already bought one of the homes, which had been damaged by flooding. The other solutions "might prevent further erosion of the stream banks, but it wouldn't deal with water going downstream in a 50- or 100-year flood," Ishikawa said. The state will offer the homeowners the market value of their properties, without factoring in the "distressed condition" of the properties because of the flooding, plus their moving expenses, Ishikawa said. The exact amount offered to each owner will be determined through appraisals, he said. Several of the affected homeowners already have tried to sell their homes and could not, because of flooding concerns. "We're trying to do something to help these homeowners move and try and help the rest of the neighborhood" from being flooded, Ishikawa said. The Transportation Department is in charge of the project because it built Pookela Street, the only access to the 34-year-old Castle Hills subdivision, which includes Kupohu Street, after the H-3 highway was opened. 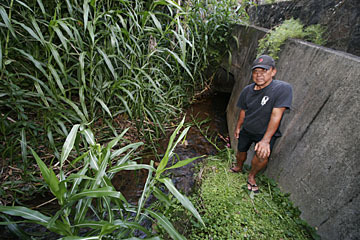 A 20-foot-wide drainage culvert built by the state allows Kapunahala Stream to easily cross under Pookela Street even after heavy rains. But just a few hundred yards downstream, in the older Kahelelani subdivision, which includes Pilina Way, the same stream backs up during heavy rains when it tries to funnel into a 4-by-6-foot city-built culvert. Working in cooperation with the state, the city plans to create a "bypass" drainage from the new detention pond around homes on Pilina Place that have suffered from flooding and ground-water seepage in the past, said Marvin Char, civil division chief for the city Department of Design and Construction. "Our consultants are working with their consultants," Char said. Ishikawa said the detention pond would be paid for with Department of Transportation funds requested from the Legislature next year. Richard Nakamoto says this 4-by-6-foot drainage hole is too small to handle water runoff, especially since the city does not clear the debris from it. Kapunahala Stream backs up during heavy rains when it tries to funnel into the culvert. U.S. Sen. Daniel Inouye's chief of staff, Jennifer Sabas, said $4 million in federal Department of Transportation money is already set aside to assist the state and city with the project. More might become available, she said yesterday. 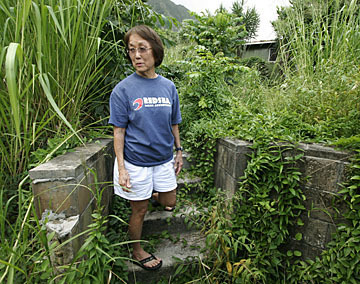 Some Kahelelani residents tried to warn government officials about the way the Castle Hill subdivision was created 34 years ago, said Richard Nakamoto, who has photographs of the land back when it was taro patches. The Castle Hill subdivision developer built that land up 30 feet, raising it higher than the Kahelelani subdivision and changing the flow of water in the area, said Nakamoto's son, Kyle. Both Nakamotos live on Pilina Place, which is part of the area affected by the new water flows. Joe Orchowski, one of the affected owners on Kupohu Street, said his neighbors have one of three reactions to the state's proposal: They are thrilled to be able to sell their property, heartbroken at having to leave their homes or just trying to adjust to the situation. Some homes in the area are selling for about $650,000. If the state paid that price, the cost of 10 homes would be $6.5 million -- not including moving expenses.